Today I have a secret recipe for a delicious pizza served at California Pizza Kitchen. The California club pizza is a combination between pizza and a salad. A pizza is topped with bacon, grilled chiekn, Mozzarella and baked until the crust is nice and crispy. Then it’s topped with avocado, arugula, tomatoes, basis and Romaine lettuce with a lemon-pepper mayo. In a small bowl, sprinkle yeast over (very) warm water; let stand for a few minutes and set aside. In a stand mixer, using the paddle attachment, combine flour and salt. With the mixer running on low speed, drizzle in olive oil until combined with flour. Next, pour in yeast/water mixture and mix until just combined, and the dough comes together in a sticky mass (clean from the sides of the bowl). Coat a separate mixing bowl with a light drizzle of olive oil, and form the dough into a ball. Toss to coat dough in olive oil, then cover the bowl tightly with plastic wrap and set it aside for 1 to 2 hours, or store in the fridge until ready to use. Roll/stretch out one pizza crust (recipe makes two). Lay on a sheet pan or pizza pan/stone drizzled with olive oil. Drizzle a little olive oil on the crust, then sprinkle on a little salt (optional). Evenly spread mozzarella cheese over crust, sprinkle cooked & cubed chicken, lastly sprinkle bacon. Bake for 10 to 15 minutes, or until crust is golden brown and toppings are bubbly. Remove from the oven and layer tomatoes. In a small mixing bowl mix lettuce, mayo, lemon juice, and pepper. Layer on top of tomatoes. Top pizza with sliced avocados. Enjoy immediately. Today I have a secret recipe for a flavor-packed dish served at California Pizza Kitchen. 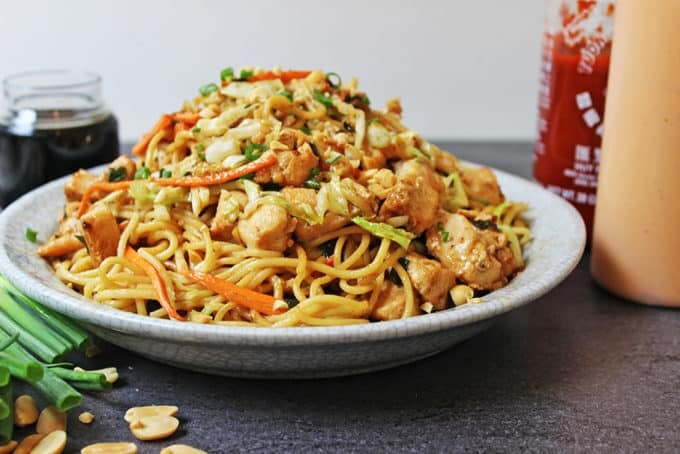 This Thai peanut chicken pasta is made with white meat chicken, vegetables, and a spicy honey-peanut sauce that’s full of umami. This crowd pleasing dish is easy to make at home. Bring a pot of water to boil. Add 1-2 tbsp of salt to season the water. Cook pasta, al dente (I shoot for a minute shy of what the box says) Drain pasta and toss with 2 tbsp sesame oil. Pat dry the inside of the pot and add 1 tbsp of sesame oil. If you would like to add some green onions as a garnish at the end, reserve ¼ cup of them before putting the rest in the pan. Add the green onions, carrots, napa cabbage, chicken, garlic and ginger. Saute for a minute or two until they have softened and barely start to turn color. Add in the honey, peanut butter, soy sauce, vinegar and Sriracha. Stir all the ingredients together and add the pasta back into the pot. Toss the pasta with the rest of the ingredients and serve. Garnish with remaining green onions if you chose to reserve some. Today I have a secret recipe for a flavorful pie served at California Pizza Kitchen. The white spinach pizza is loaded with roasted garlic, fresh spinach and a blend of cheeses. You can get pre-made pizza dough at your local grocery store or from your favorite pizzeria. For a nice and crispy crust, use a pizza stone in your oven. Preheat oven to 450 degrees Fahrenheit. Use a pizza stone if you have one, otherwise use a cookie sheet. In a small skillet, warm the oil and garlic together over low-medium heat, whisking to get the garlic to ‘melt’ into the oil. Go help a kid with an essay and forget about the garlic for at least 10 minutes, until the bits of it are slightly browned but not burnt. Or just warm and whisk for 5 minutes, your choice. Brush the warmed garlic oil across the pizza dough. Scatter the spinach across the top (I tore as I scattered, but I started with large stems of spinach–oh, if you have large stems like me, give the stems to the composting pigs and just use the leaves). Sprinkle feta cheese over top, then the shredded Italian blend. Shake Italian seasoning over the pizza. Slide the whole thing, parchment and all, into the oven. Bake at 450 degrees for 7-9 minutes. Shake the pizza off the parchment and onto the stone (or sheet). Bake an additional 3-5 minutes until the cheese is browned and bubbly. Cool on a wire rack then slice and serve. Today I have a secret recipe yummy dessert served at California Pizza Kitchen. Their butter cake is so simple but so delicious. Light and fluffy with just the right amount of sweetness. Serve it with a little whipped cream or top it with some fresh berries or jam. Rub the first 1/2 stick of softened butter on the bottom and sides of the pan, leaving a thicker layer on the bottom, as evenly as you can. Pour 1/3 cup sugar into the buttered pan, swirl it around to lightly coat the sides and leave a heavier, even coating on the bottom of the pan. Set aside. With and electric mixer or in the bowl of a standing mix, beat the remaining 1 and 1/2 C butter and 1 cup of sugar until pale and fluffy (5 minutes). Add egg and yolk and vanilla, beat until combined. At a low speed, add flour mix and milk alternately until just combined. Combine the cream cheese with the remaining 1/4 cup sugar, egg and 1/4 teaspoon vanilla. Mix well with a blender. Gently spread over the top of the cake batter. Bake 45-50 minutes until golden brown and a toothpick or fork comes out clean. Cool cake in pan 10 minutes. Remove parchment paper and let cool. 2) Lose The “Mommy Belly” & Bring Back Your Flat Tummy!